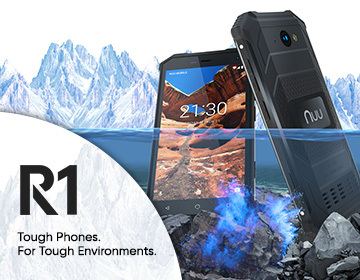 Take part in high-definition video calls on super-fast mobile networks using the inexpensive new NUU Mobile G1 smartphone. The G1 operates on the latest high-speed mobile networks, called 4G LTE. The phone incorporates the latest high-speed video technology to eliminate the signal delays and screen jitters that used to be common on mobile chat. When you blend a high-speed network with improved video technology, you get fast transmissions and crystal-clear reception. The audio on your G1 also benefits from the same technology, making it seem like you’re speaking with a person sitting right next to you. Take advantage of the latest technological advances in the mobile phone world with the new G1 smartphone, where you’re powered for life on the Go. Don’t let the G1’s super-low price fool you. The new G1 smartphone incorporates the latest technology to provide you with everything you need in an unlocked smartphone. Take network connectivity, for instance. The G1 is designed to operate on the fastest mobile networks available, 4G LTE. Don’t worry, the high-tech G1 works superbly on 3G and 2G networks too. The G1 also connects efficiently to GSM networks. Though you can still make video calls on 3G or GSM networks, the phone’s high-speed features are available only on high-speed networks. High-priced phones with ViLTE capability began rolling out late last year. The new video technology appears in the Android Go version of the operating system that was released last year. The G1 smartphone employs a slimmed-down version of Oreo, an operating system called Go. Go supports both VoLTE and ViLTE, which puts the G1 smartphone on the cutting edge of new transmission technology. Upgrade from a voice call to a video call. With a 5.7-inch screen that features 18:9 resolution, your video chats on the G1 will appear crystal clear. The signal is stabilized for easy viewing on both ends. You’ve never looked so good on video chat! ViLTE is based upon earlier technology for audio, called VoLTE. Two years after the first 4G LTE network was introduced, the first full-featured VoLTE network debuted in Singapore. U.S. mobile networks swiftly adopted the new protocol, which dramatically improved the quality of voice transmissions on LTE networks. Offers better access to WiFi networks where signals are weak. With the introduction of the G1 smartphone, you no longer need to sacrifice performance for price. The affordable G1 provides you with access to the latest technology, including high-speed video chat, on the fastest mobile networks in the world. At a great price. To learn more, or get your own unlocked NUU Mobile G1, click here on Amazon, or here at NUUMobile.com. NUU Mobile produces budget-friendly smartphones without sacrificing features or performance. Check out NUU Mobile’s offerings online.